On this page I would like to present some of the projects I was involved in. As the list is already quite long the following list is only a selection of the projects I have completed, and the list does not reflect all programming languages and technologies I am familiar with. Please refer to the Technical Skills page for the complete list of skills. I was the main (and sometimes the only) developer for all the following projects. Projects are ordered by year and have been tagged as research project, freelance project, hobby project or school project. A novel presentation tool based on web technologies. See http://mindxpres.com for more details. Presentation tools such as PowerPoint originated as simulators for physical photographic slides, but they also inherited all limitations. For instance, content is still relatively static, spatially bounded and presented in linear sequences, even though computers are capable of so much more. We addressed some issues related to dynamic content, interactivity, portability, presentation hardware, content reuse and content sharing. This has resulted in a new presentation tool called MindXpres, with many new features not found in existing commercial solutions. Please refer to http://mindxpres.com for more information. A model-driven cross-media hypermedia linking platform based on the RSL meta-model. This platform allows users to store arbitrary small snippets of content (e.g. images, text, video or source code) and link them together with multidirectional semantically annotated links to form larger structures such as presentations, books or websites. Although it is much more flexible and complex, the system might be compared to an advanced graph-database. 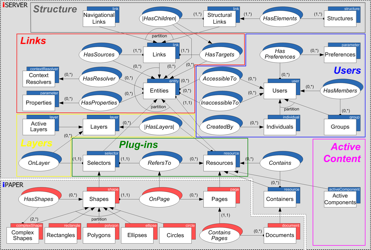 The system is model-driven, meaning that the user should define a schema and everything else is handled automatically. The system provides features related to security, user management, sharing, reuse, versioning, querying and context resolving. Various interfaces and APIs are provided to interact with the system. The system was developed to be performant and to be able to handle very large collections of data. For this reason, the platform is able to modify, compile and reload parts of its code in the reasoning and storage layers at runtime. This allows the system to maximise its performance for the given models and avoids multiple layers of performance-reducing abstractions. An extensible framework for data-exchange between otherwise incompatible devices. INFEX is a generic extensible framework that performs automatic protocol mediation and translation. This allows devices with different software and hardware specifications to exchange data, even if this was previously impossible. INFEX allows users to bypass proprietary software and abstracts technical difficulties away from end users. Please refer to the main INFEX paper for more information. 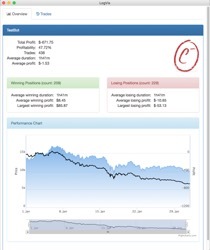 Backtesting framework for algorithmic trading. The framework allows traders to implement trading strategies (e.g. stock, forex or cryptocurrency data) and to test them against historical data to see how the strategy performs. The framework is based on pipeline programming, allowing developers to build chains of reusable modules. For instance, the first node of the chain might be reading price information from real-time broker API or zip archive, the next module in the chain might fill in gaps in the data, the next one might aggregate it into hourly "candles", then a series of following indicator modules might make some advanced calculations (e.g. moving averages or RSI) and at the end of the chain the results are given to the implemented strategy (a "bot") which can decide to buy or sell based on the incoming data. Data is "pumped" through the chain as fast as the first node can provide data. A custom binary format based on delta compression was also developed so that years worth of high-frequency price data can be kept in memory, allowing bots to be fed years of price data within seconds. Each module runs in a separate thread, allowing the simulation to make use of many-core server hardware for faster execution. High-level functions are provided to measure the performance of a bot. A lot of commonly-used indicators are provided as modules that can be used in the dataflow chain. For each simulation a log is kept, which can be visualised with an included tool so that users can see the performance of their strategy over time, where it went well or less well, and also the details for every trade that was made by the bot. Out of interest I have worked on my own hardware-accelerated 2D game engine in modern C++. The engine implements asset management, user input, tile-maps, scaling, rotating, filters, particles and multiple cameras. The SFML library is used to implement some of these features. It also supports a complex game loop with variable framerates. A higher-level programming interface is provided so that complex game scenes can be composed and managed with minimal effort from the programmer. The project has always been an mental exercise and it was never used in a real product. 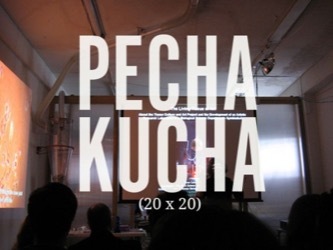 PechaKucha presentation tool and PowerPoint convertor. The VUB Crosstalks organisation asked me to developed a presentation tool for the PechaKucha presentation format where the presenter shows 20 images and spends 20 seconds on each images (automatically timed). The tool includes a PowerPoint plug-in that can convert a PowerPoint presentation into an HTML-based PechaKucha presentation. The presentation bundle can then be run on any device with a web browser, and it will go through the 20 images with a small discrete 20-second timer in the corner. At the time of writing (2018) the tool is still used at Crosstalk events. Application for selecting random exam questions from a pile. Some oral exams require students to randomly select some questions or topics from a physical pile of cards. However, a lot of time is wasted picking, shuffling and arranging the cards. To help save time, a small digital application was built that allows students to select their cards digitally. The application is made in web technologies and is often used on a smartphone or tablet. The animated screenshot shows a scenario where a student has to select three cards (example questions are used in order not to leak real exam questions) and is then able to remove one that will not be discussed. POS and store management application. As part of a school project I was required to build a functional application for a small shop. Cashiers can use the tool as a point-of-sale application, and manager accounts can also manage the stock and orders. 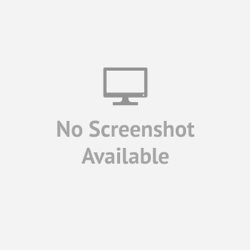 File, screenshot and screencapture upload tool. iOJ is a desktop application that allows users users to easily upload any file to the iOJ cloud service and get back a shareable link. A shortcut is provided in windows explorer context menus to make file uploads more convenient. The tool is also capable of taking and uploading screenshots and desktop recordings. The Windows version was made in .NET and an OSX version was made in Java. I developed a Firefox plug-in for tinypaste.com, a web service that allows users to upload and share text snippets (comparable to Pastebin). The plugin would add an option to the contextual menu allowing users to quickly upload and share any highlighted text on a website. 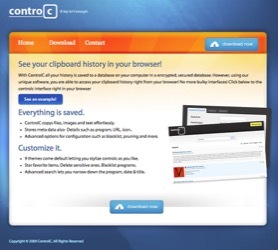 ControlC is an application that keeps track of your clipboard history allowing you to easily search and find important information. 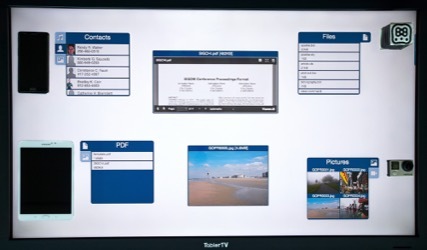 The application also displays from where the information was copied and information can be shared with friends. All information is stored in a local encrypted database and a user-set password is required to view the clipboard history. The client for this job required the application interface to run in the browser, so the tool incorporates a basic web server and the user interface is built with web technologies, even though it an offline desktop application. This is a download manager for HTTP downloads, made in the Ruby programming language. Files can be queued for downloading and the application will go through the queue and download a configurable amount of them in parallel. Downloads can be paused and resumed. The application was made to be usable in a terminal and offers a console interface based on ncurses. 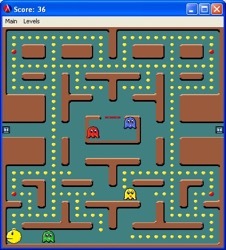 This is a complete implementation of the well-known classic pacman game. It was made for a school project in the Scheme programming language, a dialect of Lisp. Vision-based limb tracking and gesture detection hardware and software. 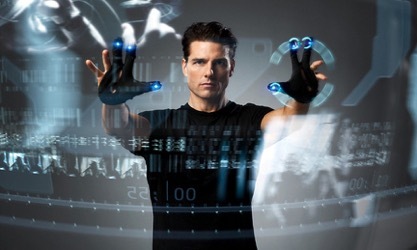 The goal of this school project was to implement gesture tracking for the hands, much like in the sci-fi movie Minority Report. To achieve this I prototyped a device that contained a matrix of infrared LEDs, a color camera and an infrared camera. The LEDs emit bright infrared light towards the user, which is reflected back by the user's limbs and captured again by the infrared camera. This gives us the contours of the user's hands and arms. These contours are then mapped on images from the high-resolution color camera where the exact position and orientation of the fingers is estimated. These positions are tracked over time and dynamic time warping is performed to detect pre-defined gestures (based on pre-trained models). A proof of concept application was developed to select pictures, move them in 2D space and resize them using gestures. Note that this was implemented before devices such as the Kinect existed. POS software and access control for a solarium. I was asked to develop easy to use point-of-sale (POS) software for a solarium, as well as an automated system that gives customers access to tanning booths with their customer cards. The POS application was run on a touchscreen so large buttons for the cashier interface were required. 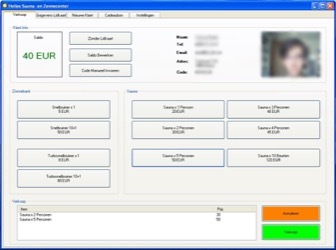 The access software interfaces with a barcode scanner as well as with the access games to provide customers access to the tanning booths if they had sufficient credit left on their account. Internal facturation and management software. I was hired to create software for internal use for a consultancy firm called JFT Group and was later put on a similar project for Capitole Gent (via JFT Group), which is a large event theatre. Work included a web-based facturation system where orders and payments could be tracked and PDF documents could be generated for the customers. As Capitole Gent is a large event theatre their internal system also included the management of events, theatre rooms, catering and hardware (e.g. lighting or sound installations). A Gameboy emulator that plays real Gameboy ROMs. As part of a school project I have created a gameboy emulator from scratch. It was made in the Scheme programming language, a dialect of Lisp. It can interpret and execute the Gameboy CPU's instruction set (similar to the Z80) and also simulates hardware such as the RAM, ROM, Video RAM and related Keywords (memory banks and the mapping thereof). The Video RAM buffer is rendered on a simulated display. The application can play real Gameboy ROM files. Online appointment scheduling system with PDA front-end for doctors on the go. This applications allows patients and medical staff to manage appointments. Doctors were provided with a portable interface on a PDA saving them a lot of time that was previously wasted on coordinating. Multithreaded web server for static content. As part of a school project I implemented a functional web server in C++. It uses a threadpool to handle requests in parallel and can serve static files. This search engine aggregates results from existing public APIs and augments it with crowdsourcing. User's votes, tags and discussions are taken into account in the ranking algorithm. Various clients for IRC, POP3, SMTP and MSN. For a while I was fascinated by various protocols and I have implemented basic clients (from scratch) for a variety of protocols. IRC: developed a basic IRC client with all basic features (joining servers, joining channels, sending channel/private messages, receiving messages). POP3/SMTP: developed a basic email client for the POP3/SMTP protocol. Features included retrieving and sending email. This also resulted in a small tool for email spoofing which is shown in the screenshot. MSN: I reverse engineered parts of Microsoft's MSN chat protocol and implemented a basic client that was able to retrieve the contact list and send/receive messages. I was asked to develop a branded web browser for Silvermead Group. 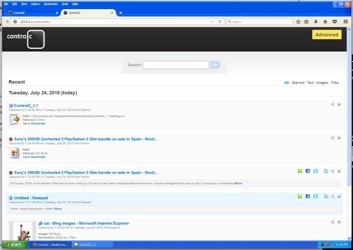 In order to keep this doable VB6's webbrowser control was used (based on the IE engine) and a new branded interface with tabbed browsing, which IE6 did not have at the time. Application for sticking virtual post-its on your desktop. Plakit is an application that allows users to stick post-it notes on their desktop. Notes can be customised and an alarm can be attached to each note if users wish to be notified at a predefine time. 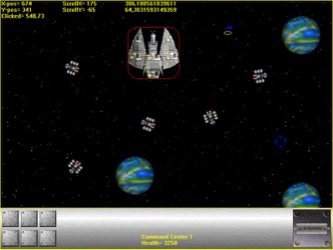 Space Frontier is a game of the RTS genre with a space theme. It was developed in Visual Basic 6 and uses Direct2D for hardware accelerated rendering of the sprites. Generates maths exercises as MS Word documents. I was hired to create a tool for teacher that allows them to generate exercise sheets with maths exercises. Teachers could select a topic (e.g. addition, multiplication or fractions) and a difficulty, and the tool would generate a Microsoft Word document with the exercises. 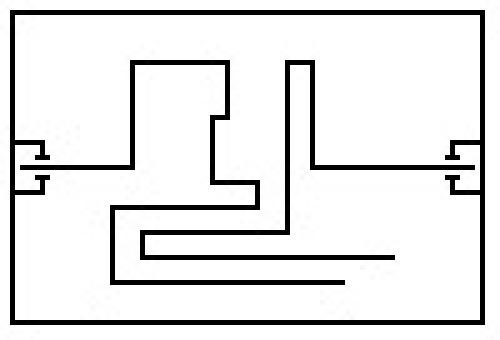 Snake-like game for the TI-83+ graphing calculator. This snake-like game was developed in assembler for the TI-83+ graphing calculator which uses a Zilog Z80 CPU. The game features local two player gameplay and ends when one of the players crashes their snake into the other snake.